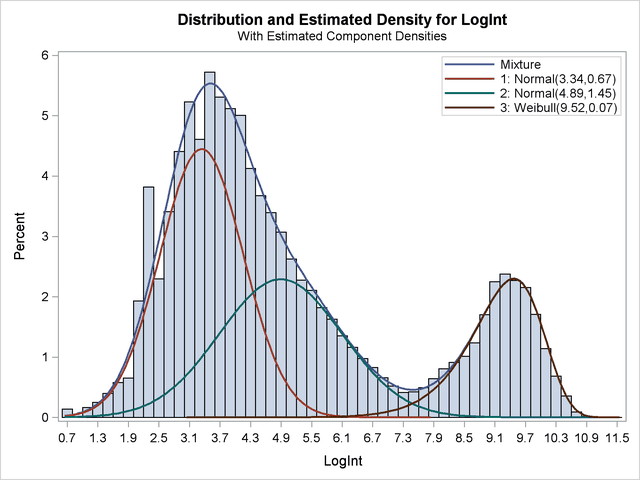 When I learn a new statistical technique, one of first things I do is to understand the limitations of the technique. This blog post shares some thoughts on modeling finite mixture models with the FMM procedure. What is a reasonable task for FMM? When are you asking too much? The further away the components are, the easier it is to resolve them. The more data you have, the better you can resolve components. If you can give the software hints about the components, you can resolve them better. These lessons are not surprising, and the first two are used to determine the "power" of a statistical test. In brief, the larger the "effect" you are trying to measure, the easier it is to measure it. Similarly, larger samples have less sampling error than smaller samples, so an effect is easier to detect in larger samples. The third statement (give hints) is familiar to anyone who has used maximum likelihood estimation: a good guess for the parameter estimates can help the algorithm converge to an optimal value. To be concrete, suppose that a population is composed of a mixture of two normal densities. 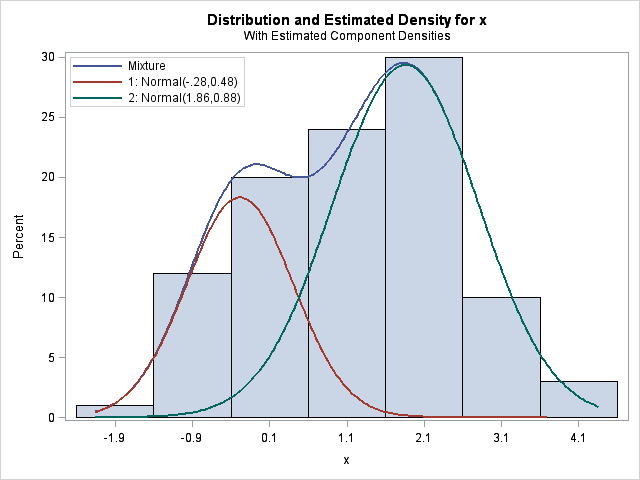 Given a sample from the population, can the FMM procedure estimate the mean and variance of the underlying components? The answer depends on how far apart the two means are (relative to their variances) and how large the sample is. 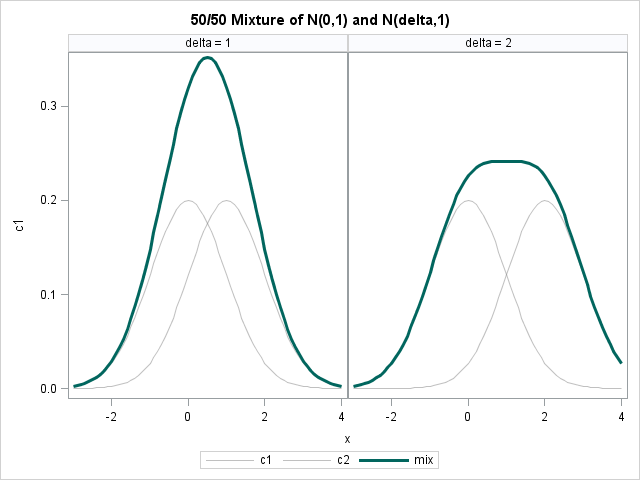 The following figure shows the exact density for a 50/50 mixture of normal distributions, where the first component is N(0,1) and the second component is N(δ, 1). The figure shows two cases: δ=1 and 2. Would a human be able to look at the dark curve on the left and deduce that it is a mixture of two normal components? Unlikely. The problem is that the distance between the component densities, which is 1, is not sufficiently large relative to the variances of the components (also 1). What about the dark curve on the right? Perhaps. It depends on the person's experience with mixture models. /* Doesn't identify underlying components for delta=1. The conclusions are clear, if you have a small sample, don't expect to the FMM procedure to be able to estimate components that practically overlap. If you have a larger sample, the FMM procedure has more data to work with, and can detect components that do not appear distinct to the human eye. For example, if you rerun the previous example with, say, 10,000 simulated observations, then the FMM procedure has no trouble correctly identifying the N(0,1) and N(1,1) components. This "lesson" (more data leads to better estimates) is as old as statistics itself. Yet, when applied to the FMM procedure, you can get some pretty impressive results, such as those described in Example 37.2 in the documentation for the FMM procedure. In this example (reproduced below), two normal components and a Weibull component are identified in data that does not—to the untrained eye—look like a mixture of normals. From biological arguments, researchers knew that the density should have three components. Because the biologists had a large number of observations (141,414 of them! ), the FMM procedure is able to estimate the components. "Well, great," you might say, "but my sample is small and I can't collect more data. 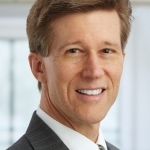 Is there any other way to coax the FMM procedure into finding relatively small effects?" Yes, you can provide hints to the procedure. The sample and the choice of a model determines a likelihood function, which the procedure uses to estimate the parameters in the model for which the data are most likely. The likelihood function might have several local maxima, and we can use the PARMS option in the MODEL statement to provide guesses for the parameters. I used this technique to help PROC FMM estimate parameters for the three-component model of my mother's Scrabble scores. It is important to understand the limitations of any statistical modeling procedure that you use. Modeling finite mixtures with PROC FMM is no exception. If you know which tasks are reasonable and which are unrealistic, you can be more successful as a data analyst. I'm new to the fmm procedure and I find this very interesting, can you please show an example where you use multivariate continius data? The FMM documentation has three Getting Started examples and three more advanced examples. Next month at SAS Global Forum 2012 there is a paper and SuperDemo on the FMM Procedure. The paper will be in the proceedings. But in my case, SAS can't handle the option partial. All the observations from the data Iris are only assigned to one group. And it didn't matter whether I used the compromised version of the variable Species or all information given. Do you have any idea how to solve this problem? Yes, post your question and sample syntax to the SAS Support Communities. 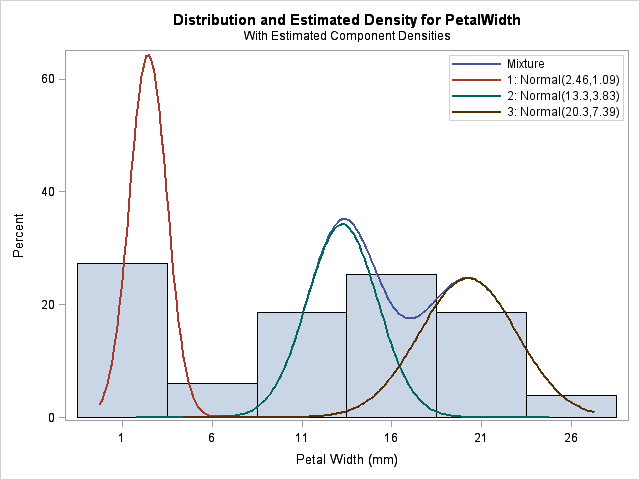 You can use the PARMS option to specify estimates for the center and scale parameters of the candidate distributions, as shown in the article "Modeling finite mixtures with the FMM procedure." Okay, thanks, I am going to post my question and sample syntax to the SAS Support Communities.